So, I finished getting all the new designs up at the Emporium -- though I should still do a little non-essential housekeeping there -- and naturally had new ideas come along as I worked. 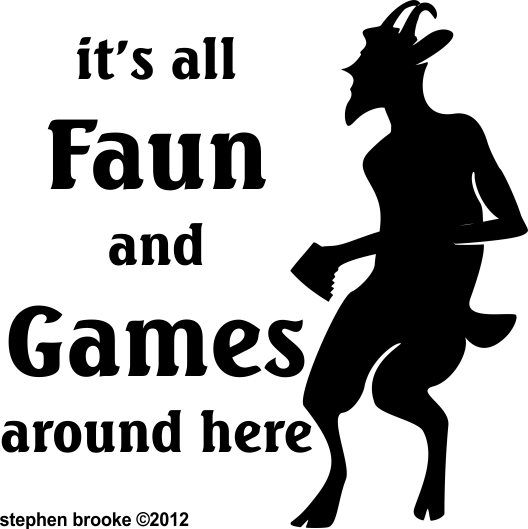 For instance, the little faun silhouette I created a couple months back returns with some changes and text. It's good to have a lot of designs available, even if some are really just throw-aways. It brings people in; if they don't buy one thing they might just buy another. It's the internet business plan and works for any sort of merchandise. Books, music, whatever -- it's going to be there online 'forever' (assuming you leave it up) so there is not hurry to have a big seller, a 'best seller.' Just keep selling, day after day, and think long-term. And keep plugging that product, of course.